I have enjoyed making things for as long as I can remember. Whether drawing, painting, printmaking, potting, making baskets, designing graphics, sewing, felting or gardening, I am most happy when I am expressing myself with my hands. 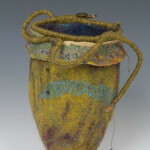 In 2004, on a trip to the now defunct Fiber Arts Center in Amherst, Massachusetts, I saw a felted vessel in the gift shop and I wanted to know what it was and how I could learn about it. Through the Arts Center, I met Chris White, author of Uniquely Felt, who lived nearby. 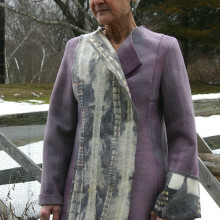 I took several classes with Chris, who gave me a solid foundation and understanding of turning wool into beautiful fabric. I completely immersed myself in the medium. My work is about color, texture and spatial relationships, that is, where color and shape move forward and backward. My felt also incorporates elements of other media. For me, the act of laying out fiber is like painting on a canvas. 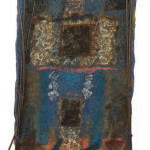 Often, I combine paint and/or stitching onto the surface. When thinking about what can drive a piece, I’d say, graphic design has brought order and geometric elements, pottery and basket weaving, form, and painting, surface design. 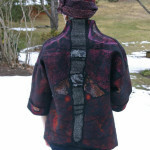 While my work reflects creativity or artistry, the technical aspect or craft of feltmaking is just as important to me. Sometimes, when beginning a project, it is more important for me to make, than to know what I will make. 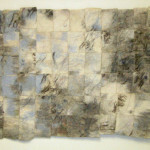 At the most basic level, my work reflects an enjoyment and curiosity of the materials, and of the felting process itself. I love the tactile sensation of getting my hands wet, of blending colors, and of shaping forms. 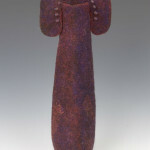 The slow, meditative work pace appeals to me, because of its contrast with the rush and complexity of daily life. 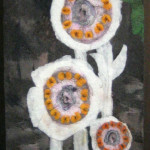 I like the solitude of felting, but I also enjoy its collaborative aspect. 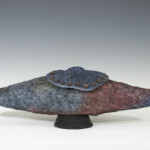 This combination of solitude and working with others has made felting the most rewarding medium that I have worked in. I enjoy taking classes and felting with friends… learning more techniques and watching how others work. The people I have met and the exchange of information and ideas has been rewarding and fulfilling. I teach and make one-of-a-kind wall hangings, items for the home, vessels and wearables.